It’s the weekend! Finally. This week felt long. But the weather has warmed up, and we were actually able to saunter out onto the deck barefoot to enjoy this fresh NC flounder cooked in parchment. 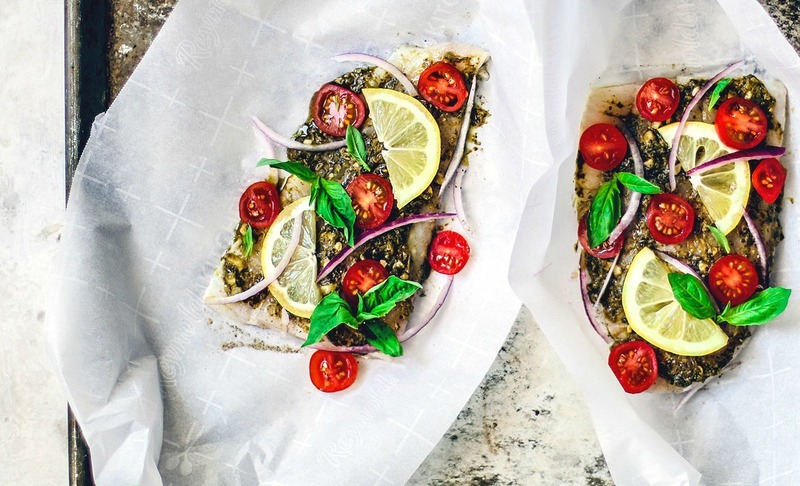 Fish baked in parchment paper is honestly one of the best ways to cook fish. It’s almost impossible to mess up, and the presentation is really damn pretty. Cooking fish at home is intimidating for a lot of people. For one, it can dry out easily which leaves you with an awful texture. Further to that, fish can lack flavor if under-seasoned—much like chicken. Depending on where you live, many restaurants are knocking fish dishes out of the park these days. The first thing I look for on menus anymore is salmon. (So good!) But you can totally achieve this kind of fish dinner at home, and this parchment method is the perfect place to start. Because the fish is steamed in parchment packets, it comes out super tender and moist. The other plus is that you end up with loads of flavor. Snuggled into a pouch with fresh herbs, vegetables, butter, and wine, your fillet absorbs all of those aromatics. It’s also super easy to play around with flavor combinations! Preparing fish in parchment, even just once, will open your mind to numerous possibilities. Let the inspiration flow! Two of my favorite ways to prepare this dish is with these Mediterranean flavors, and this soy and ginger combo. The perfect side dish for a main like this, in my mind, is anything fresh and seasonal. These braised fingerling potatoes with fresh herbs would be perfection. I’m also super inclined to braise some spring vegetables soon. I just happened to stumble upon Splendid Table’s podcast episode on braising veggies from last year and I am *so* into that idea. However you serve it, I hope you love it. If you try this recipe or create your own variation, let me know in the comments! I love connecting with you. Then snap a photo and tag me on the Insta @killing__thyme and be featured in our newsletter. 2 6 oz fillets of flounder This recipe would work with any mild white fish, and even salmon! Preheat oven to 425° F. Remove fish from packaging, pat dry with paper towels, season with salt and pepper, and set aside on a plate. Cut the parchment into two segments — one segment per fish. The size of the parchment depends on the size of your fillets, but you should be fine with a piece of parchment that measures approximately 13" wide. Lay each segment down on a flat surface. Place one fillet in the center of each parchment paper (skin side down if there's skin). Slather 1 TBSP of pesto over each fillet, then top with tomatoes and onions. Drizzle the white wine over the fillets and drop 1/2 tsp of butter onto each fillet. Place the parchment packs onto a baking sheet and bake for 12-15 minutes, or until the fish is opaque, flaky, and has an internal temperature of 145° F.
For a specific walkthrough on baking fish in parchment, click here. *Note: There are several ways to prepare parchment packets; I used to seal my packets by brushing the edges with a diluted egg wash, then fold the edges over one another to create a secure packet with no air vents. But after playing around, I’ve realized that the “twist and tie” method brings the same results to the table without the fuss. I hope you dig this technique, Leanne! It's great. I love cooking fish different ways, but this has *got* to be one of my faves. Flounder isn't a fish we get wa-a-a-y up here, but this will be delicious with cod or halibut, I'm sure! A fun presentation for a deck party, too. Thanks! Absolutely, Elaine! I can't think of a fish that wouldn't work with these particular flavors, actually. You're good to go! Bare feet on the deck sounds wonderful to this Canadian! Thank you for your great tip for keeping fish moist.